In his History of the Roman Breviary, Msgr. Batiffol correctly notes that “the tendency to multiply the festivals of saints will always be found to exert more power, and to command more sympathy, than any plan for reducing them.” (p. 305) The same thing may well be said about the tendency to multiply rubrics. As noted earlier in this series, the basic rubrics of the Breviary of St. Pius V are much shorter, clearer, and better organized than those of its medieval predecessors; they also left unresolved a number of questions about how to say the Office. Over the following centuries, therefore, they were frequently added to and expanded, becoming ever more precise, and as a result, ever more complicated. In the editio princeps of the Breviary of St. Pius V, the general rubrics occupy a total of seven pages. I own a copy of the Roman Breviary printed in 1900, in which they occupy 32 pages of rather smaller type, followed by 13 pages of proper rubrics for the Discalced Carmelite Order. To give just one example of the way the rubrics were expanded: in the Breviary of 1570, the feast of Saints are classified in three grades, double, semidouble and simple. The first of these three was originally reserved for the most important feasts; over time, however, as the number of saints on the general Calendar increased, it came to be generally used as the entry-level grade for all new feasts. In order to maintain a distinction between, e.g., Easter, and a local confessor-bishop of uncertain history, the grade of double was later divided into four categories: First Class, Second Class, Major and Minor. Each of these four was then subdivided into “primary” and “secondary” feasts, the former being used for the main feast of a particular saint, and the latter for feasts such as the translations of relics, or miracle-feasts like the Apparition of Saint Michael. Thus the Office came to have effectively ten classifications of feasts. Similar changes were made to the rubrics of the Missal, with a view to accommodating all possible concurrences of feasts and commemorations. Before the reform of 1911, the rubric printed before the preface of the Holy Trinity is thirty words long, including the date it was formally enacted. In the edition following the 1911 reform, it is expanded to 279 words, forming two head-spinningly complicated Latin sentences. The lengthy “Additions and Variations to the Rubrics”, added to the Missal by the same reform, contain a number of sentences in which the subject can only be seen from the principal verb on very clear days. In March of 1955, therefore, a decree was issued by the Sacred Congregation for Rites, simplifying the rubrics of both the Breviary and Missal. I will here limit myself to enumerating the more salient features of this reform; the complete text is available in the online version of the Acta Apostolicae Sedis. I have attempted to describe these changes in a more clearly organized way than they are given in the decree itself. 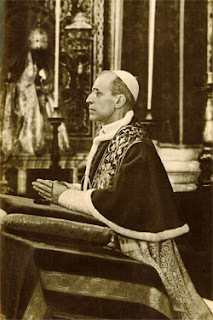 The reader must keep in mind a particular feature of the reform of St. Pius X, namely, that most saints’ offices of nine readings were also provided with a simplified version of the saint’s life, summarizing it in a single lesson. This simplified lesson was to be used, according to certain rules, when the saint was only commemorated; in the reform of 1955, and the later reform of 1960, it will come to play a very important role. When an office is reduced from nine readings to three, only the simplified lesson is left. The following changes of a general nature apply to both the Missal and the Breviary. 1. The rank of semidouble is suppressed. Offices of the temporal cycle which were traditionally kept as semidouble (including all Sundays) are raised in rank to doubles; feasts of the saints formerly kept at this grade are reduced to simples, i.e. offices of only 3 readings at Matins. 2. The custom of anticipating certain Sundays to the preceding Saturday is suppressed. 3. The vigils of Christmas, Pentecost, the Ascension, the Assumption, St. John the Baptist, Ss. Peter and Paul, and Saint Lawrence are retained; all other vigils, whether of the general Calendar, or of any local Calendar, are suppressed. If the vigil of a saint should fall on a Sunday, it is no longer to be anticipated to the preceding Saturday, but simply omitted. 4. All octaves are suppressed, both on the universal Calendar, and on all local Calendar, except those of Christmas, Easter and Pentecost. This entails four octaves of the temporal cycle (Epiphany, Ascension, Corpus Christi, Sacred Heart), and ten of the general Calendar. (The Assumption, Immaculate Conception and Nativity of the Virgin Mary; the Birth of St. John the Baptist; Ss. Peter and Paul; All Saints’; St. Stephen; St. John; the Holy Innocents; St. Lawrence.) Provisions are made by the new rubrics for the ensuing gaps in the temporal cycle. 5. All feasts of simple rank are reduced to commemorations. The following changes are specific to the Breviary. 1. The Lord’s Prayer, the “Hail Mary” and the Apostles’ Creed are no longer said at the beginning and end of the hours. It should be noted that the Hail Mary and the Apostles Creed are thenceforth no longer part of the Roman office. The former was said only at the beginning of each hour, and the end of Compline. The latter was at the beginning of Matins and Prime, at the end of Compline, and also said in some of the Preces of Prime and Compline; these Preces were also suppressed by this decree. 2. The ferial preces of Lauds and Vespers, formerly said on all penitential ferias, are now to be said only on Wednesdays and Fridays, and on the Ember Saturdays of Advent, Lent and September. The preces of all other hours are suppressed. 3. The Suffrage of the All the Saints, and the Commemoration of the Cross which is said in its place in Eastertide, are both suppressed. 4. The Athanasian Creed is now to be said only on the feast of the Most Holy Trinity. 5. All feasts below the rank of Double of the second class (i.e., all Double majors, Doubles and Simples) are no longer celebrated with first vespers. 7. In the Missal of St. Pius X, when a feria of Lent and a lesser feast (i.e. not a double of either the first or second class) occurred on the same day, a priest might choose to say the Mass of either the feast or the feria. Permission is now granted to do the same for the Office, i.e. to say the office of either the saint or the feria. 8. The transfer or resumption of certain antiphons and of certain readings from the Scriptures from one day to another is suppressed. Likewise, the transfer of certain hymns proper to particular feast days from one hour to another is also suppressed. 9. When the office of a Sunday or vigil is impeded by an office of nine readings, the ninth lesson of Matins is no longer to be taken from the impeded office. The second part of this article will offer some observations on this reform. To read the most recent parts of this series, click here. For the complete set of links to the earlier parts of this series posted last fall, including a Glossary of terms related to the Divine Office, click here.